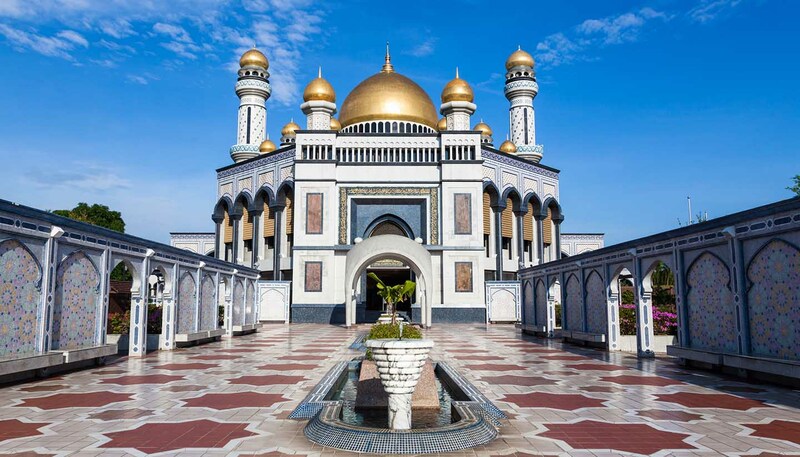 Thanks to sizeable deposits of oil and gas, the tiny tropical sultanate of Brunei Darussalam has one of the highest standards of living in the world. Its two non-contiguous territories, situated on the northern coast of Borneo in South-East Asia, are home to some of the region's most pristine rain forest habitats. The country only gained independence in 1984, but has the world's oldest reigning monarchy and centuries of royal heritage. At the helm of the only remaining Malay Islamic monarchy in the world, the Sultan of Brunei comes from a family line that dates back over 600 years. The current sultan, His Majesty Sultan Haji Hassanal Bolkiah, has been on the throne for 43 years and is one of the world's richest individuals. Visitors to the "Abode of Peace" (the literal translation of darussalam) will find the country surprisingly laid-back and relaxing. In addition to admiring the gilded domes, towering minarets and extraordinary ornamentation of two landmark mosques in the capital, Bandar Seri Begawan, tourists can explore water villages by boat and on foot, learn about local culture in several interesting museums, sample delicious Malay cuising (some of the best can be found at open-air markets), and experience the incredibly biodiversity of the Bornean rain forest in Ulu Temburong National Park. 5,765 sq km (2,226 sq miles). Bandar Seri Begawan (popularly known as 'BSB'). Sultan Hassanal Bolkiah since 1967. Around 13,000 British nationals visit Brunei every year (source: Brunei Immigration). Most visits are trouble free. Although there’s no recent history of terrorism in Brunei, attacks can’t be ruled out. Crime levels are low, but there are occasional incidents of petty crime against tourists. To contact the emergency services call Royal Brunei Police Force 993, Ambulance 991, Fire 995 or Search and Rescue 998. If you’re abroad and you need emergency help from the UK government, contact the nearest British embassy, consulate or high commission. In Brunei the consular contact number is +673 2222231 option 2. Crime levels are low, but there are occasional incidents of petty crime against tourists as well as house burglaries. Take particular care of your passport, avoid carrying valuables with you and do not leave possessions in unattended vehicles, even if out of sight in a locked boot. Drivers of vehicles not registered in Brunei can only purchase motor fuel at 10 designated filling stations throughout the country, to a maximum of 250 litres. Filling a foreign car is more expensive as the purchase price does not include a government subsidy. You can drive in Brunei with a valid UK driving licence for up to 3 months. Driving standards differ from the UK. Traffic will not always stop at red lights or pedestrian crossings. Speeding and non use of seatbelts is common. Road conditions are generally good but you should take extra care while driving through heavy rain as road surfaces are uneven. If you’re involved in a road accident as a driver, you should not leave the scene or move the vehicle until the police have attended. Police advise individuals against hiking alone in the forest, including at well-known recreation areas. It’s easy to get lost when visiting the rainforest. Use recognised and well-known guides, and stay on the footpaths. Demonstrations or large public gatherings are unlikely in Brunei. Keep yourself informed through the local media. Local laws reflect the fact that Brunei is an Islamic country. You should dress modestly and respect local traditions, customs, laws and religions at all times, especially during the holy month of Ramadan, or if you intend to visit religious buildings. His Majesty The Sultan and other members of the Bruneian Royal Family are highly revered and public criticism of them would cause great offence. There may be serious penalties for doing something that might not be illegal in the UK. If you are planning to visit or live in Brunei, you are strongly advised to familiarise yourself with local laws and customs. In 2014, Brunei began the introduction of a Sharia Criminal Code, to run in parallel with the Common Law. The final phase will be introduced in April 2019. It specifies severe punishments, including amputation and death by stoning, for certain crimes, including some that are not illegal in the UK. Most laws under Common Law and the Sharia Criminal Code apply to all people in Brunei, regardless of nationality or religion. Adultery (involving a Muslim), and close proximity between the sexes, is illegal. Homosexual activity is illegal. See our information and advice page for the LGBT community before you travel. It is an offence to criticise Islam, and for any person to consume food, drink or tobacco in public during the fasting hours of the holy month of Ramadan. For information on travelling during Ramadan, see Travelling during Ramadan. There are severe penalties for drug offences in Brunei including, in some cases, the death penalty. Other crimes may attract caning and lengthy prison sentences. The sale of alcohol and tobacco in Brunei is prohibited. Non-Muslims over 17 years of age may import a limited amount of alcohol, but must declare it to the customs authorities on arrival, and must consume it in private. A list of other prohibited and restricted items is available on the Royal Customs and Excise Department’s website. Smoking is prohibited in certain public places, including shopping and eating areas, bus stops and stations, car parks and near buildings. Places of business and offices including shops and restaurants shut between 12 noon and 2pm every Friday. Although there’s no recent history of terrorism in Brunei, attacks can’t be ruled out. You should be aware of the global risk of indiscriminate terrorist attacks which could be in public areas, including those frequented by expatriates and foreign travellers. British Citizen passport holders may enter Brunei for up to 90 days without a visa. If you have another type of British nationality, check with Brunei immigration authorities about visa requirements. Make sure the entry stamp in your passport indicates the validity of your stay. There are strict penalties for overstaying. If you’re staying longer than 90 days and/or visiting for non-tourist purposes, you will need to get a visa from the nearest Brunei diplomatic mission before you travel. Your passport should be valid for a minimum period of 6 months from the date of entry into Brunei. Brunei doesn’t recognise dual nationality. You can be refused entry if you’re found to be holding two passports of different nationality. If you’re a dual national, it’s advisable to enter Brunei on the passport on which you exited your last country of departure. While in Brunei your nationality will be deemed to be that shown on the passport which you used to enter the country. This may affect the consular assistance that you receive in Brunei. UK Emergency travel documents are accepted for entry, airside transit and exit from Brunei. They should have at least 6 months validity. You’ll have to obtain an exit and entry visa from Brunei Immigration before you travel. Standards of healthcare in Brunei are generally acceptable, though basic hospital supplies can run low from time to time. There are two significant medical facilities, the Government General Hospital (RIPAS) in Bandar Seri Begawan and the private Jerudong Park Medical Centre (JPMC). Should complications arise, medical evacuation to Singapore may be necessary. Make sure you have adequate travel health insurance and accessible funds to cover the cost of any medical treatment abroad and repatriation. Emergency dental treatment can be provided either at Jerudong Park Medical Centre (JPMC) or from local private dentists. Most branded pharmaceuticals are readily available though some items that are available without a prescription in the UK, like decongestants or anti histamines may require a Doctor’s prescription in Brunei. If you need emergency medical assistance during your trip, dial 991 and ask for an ambulance. You should contact your insurance/medical assistance company promptly if you are referred to a medical facility for treatment. Credit cards are accepted at most major establishments. However, a number of shops and restaurants will only accept cash and will not have a credit card facility. Travellers’ cheques can be cashed at banks or major hotels. Singapore dollars may be used in Brunei and are of the same value as the Brunei Dollar. Most other major currencies are convertible at banks, hotels or official moneychangers.